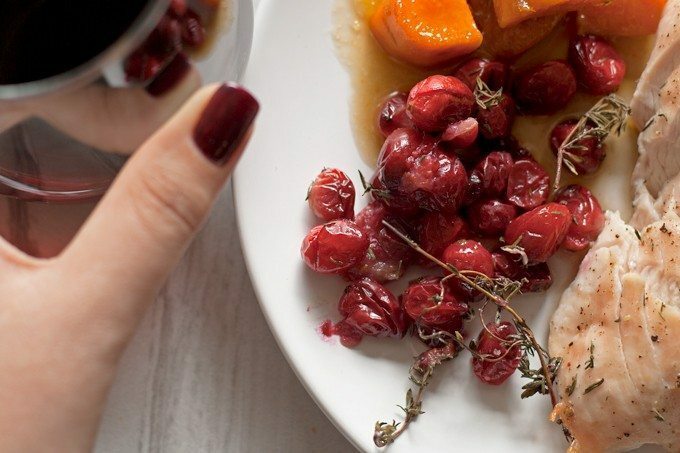 Thanksgiving dinner for two – if you can’t join your family for Thanksgiving dinner, enjoy your own at home with this easy turkey breast dinner recipe! Every year, for almost every holiday, Mr. B. has to work. When we first started dating, this bummed me out a little bit because I couldn’t really bring him “home for the holidays” to meet the family. Occasionally his day off falls on a holiday but most of the time we aren’t that lucky. I know we aren’t alone – many people will be putting in hours working in hospitals, sitting in patrol cars, or driving the city bus. If you stop to get gas on Thanksgiving or run into a store for an early Black Friday sale, someone will be manning that counter. I could go on and on about all of the jobs that require people to work on Thanksgiving or Christmas but you know who you are. And this recipe is for you. While I may host Thanksgiving for our family, I know that Mr. B won’t be able to join us so I have figured out a way to make Thanksgiving dinner for two, complete with leftovers. This recipe was actually his idea – I think he may have wanted me to make lots and lots of turkey. Plus, now we can have our own Thanksgiving dinner, just the two of us! Start with two turkey breasts. They aren’t the easiest to find but our Trader Joes location has 1 1/2 pound packages of turkey breast that are perfect for this recipe. Then butter a baking dish (yes, butter) – this is the only time I will insist on butter – treat yourself, it’s Thanksgiving dinner for two! Salt and pepper both sides of the turkey breast and place them in the center of your baking dish. 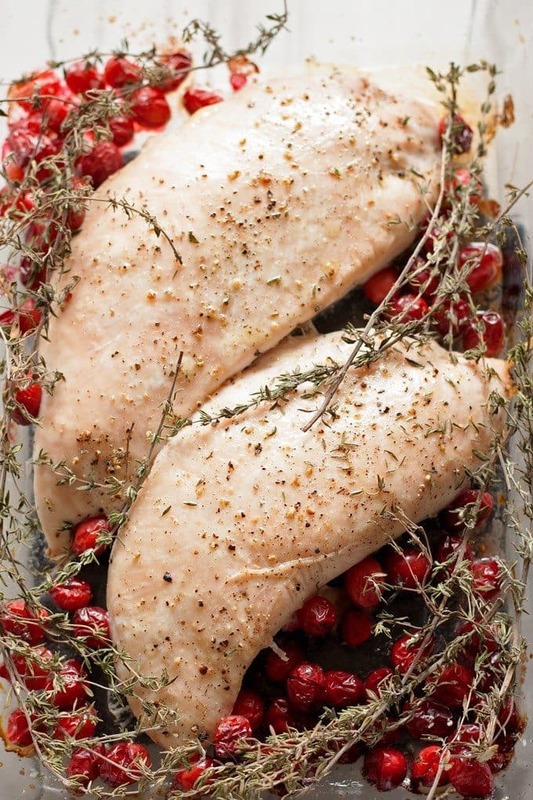 Pour the cranberries around the turkey and place the thyme sprigs on top of that. Put the dish in the oven and halfway through, brush a little olive oil on top of the turkey. While the turkey is cooking, peel and dice 2 sweet potatoes. Cook up the sweet potatoes in a small saucepan and then put them in a microwavable bowl. Sprinkle the brown sugar on top and microwave the combination until the brown sugar melts. Try to time it so that you pull the turkey out of the oven at the same time that the potatoes are done. Serve everything with some wine, a small salad and make sure you save room for dessert! 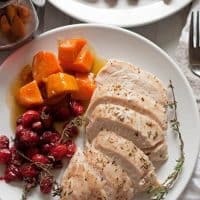 Thanksgiving dinner for two - if you can't join your family for Thanksgiving dinner, enjoy your own at home with this easy turkey breast dinner recipe! Preheat oven to 350 degrees. Grease a 9x13 glass baking dish with butter. Salt and pepper both sides of the raw turkey breast and place the turkey breast in the center of the prepared dish. Pour the cranberries around the turkey and place the thyme sprigs on top of that. Sprinkle a little salt on top of the cranberries. Put the dish in the oven and bake for 40 minutes. Halfway through, remove the turkey from the oven, brush a little olive oil on top of the turkey, and return the dish to the oven. While the turkey is cooking, peel and dice the sweet potatoes. Add the sweet potatoes to a small pot and add water until the potatoes are covered. Cook up the sweet potatoes over medium heat until tender. Transfer the cooked sweet potatoes to a small microwavable bowl. Sprinkle the brown sugar over the top and microwave in 30 second increments until the brown sugar has melted, stirring well each time. Remove from microwave when sweet potatoes are covered in brown sugar sauce. When the turkey has reached an internal temperature of 165 degrees, remove it from the oven. Allow it to rest 5 minutes before slicing it. 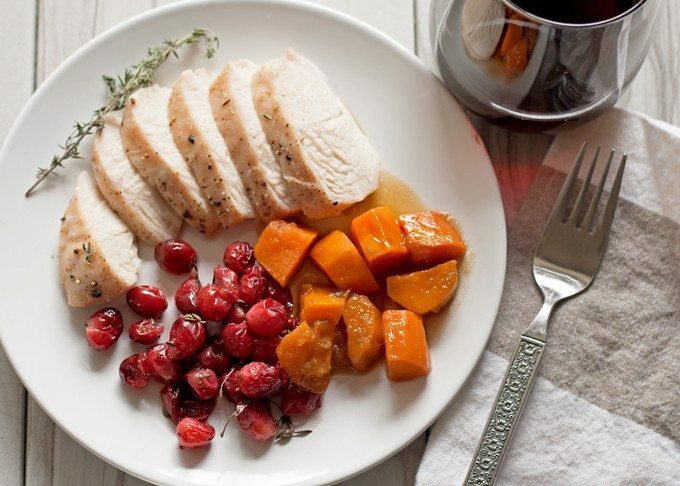 Serve the turkey and cranberries along with sweet potatoes. Tiny bites to add to your party. Looking for more Thanksgiving recipes? Try this green bean and gorgonzola casserole or this delicious dressing! Prettiest turkey breast ever! It looks SO juicy! Perfect! We are just three this Thanksgiving… so I’ll up the ante and make this for the three of us. So helpful- thanks! My husband and I will be celebrating Thanksgiving as just the two of us.. at first we were going to do tacos, than pizza.. but now we really can make thanksgiving for just us two!! Looks great! Way more reasonable than roasting an entire huge turkey and having leftovers til the end of time!! We made a full turkey last year and all of those leftovers were kind of what inspired this small-scale dinner. Thanksgiving for two is such a great idea. My brother-in-law just moved and won’t be able to make it home for Thanksgiving this year. I’ll have to share this with him! 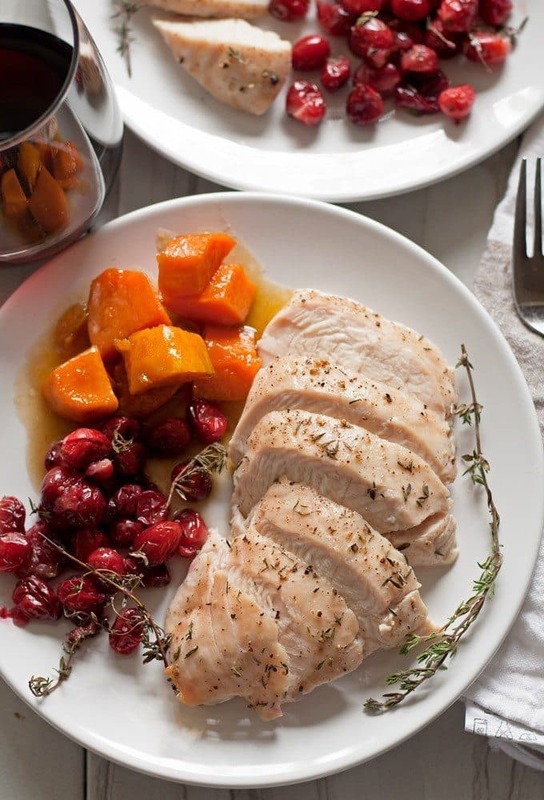 Such a simple and lovely recipe for turkey. It works even for more than 2 – I just made a pre-Thanksgiving dinner for 5 using a bone-in turkey breast. That’s great to know Laura! Thank you! How perfect is this! LOVE! This is wonderful, Jenny. You are so right about all of the people that have to work on the holidays. My sister is a nurse and hardly ever has a holiday off, so this would be perfect for her and so many others. This meal is gorgeous to boot! Thank you Ashlyn! I hope you and your family have a nice Thanksgiving! What a fun idea! A little Thanksgiving date just for the 2 of you! I love how simple it is. And I love those turkey breasts at TJs!! Looks delicious. Thank you for linking with us at #HomeMattersParty. We would love to have you again next week . What a great way to make a dinner special. Thanks for sharing with us at Throwback Thursday. Hope to see you again this week. Lovely anytime of year. Looks delicious! Pinned & shared. Happy holiday season! Thanks for joining the Inspiration Spotlight party! What a great post!! I love making just a quiet romantic Thanksgiving meal special – Thanks for sharing on the What’s for Dinner Link up! You know what this will be great as a leftover dinner for two also. I’m making dinner so whatever is left I can heat it up just like you said with the thyme & olive oil etc. Can’t wait to try it. Thanks.